The past 10 days have been filled with a number of memorable moments for us. Tonight, I am recording a “Top 10” of these moments for us in the form of memorable quotes from the week that was. So . . .
10. “It just didn’t feel right.” Dr. Samara, the lead surgeon on Kimberly’s transplant was closing her up when he noticed that the transplanted kidney felt a little limp. He trusted his instincts and redid the connection of the kidney to her artery. When he did this, his instinct was proven accurate. There was a small blood clot that had already formed. If he had not caught this it could have been disastrous. When Dr. Samara was updating me after the surgery, he said “It just didn’t feel right.” So thankful to God that He allowed Dr. Samara to catch this complication and fix it! 9. “I’m so glad we weren’t having this transplant 30 years ago.” Reflecting on the advances in transplant procedures in recent years, I mentioned to my father-in-law that I was so thankful we were doing this transplant now instead of in the 1970’s or 80’s. He reminded me that they thought Kimberly would need a transplant in the mid 1980’s. So thankful to God that her kidneys hung on for 27 years to allow us to benefit from 30 more years of medical advancement. 8. 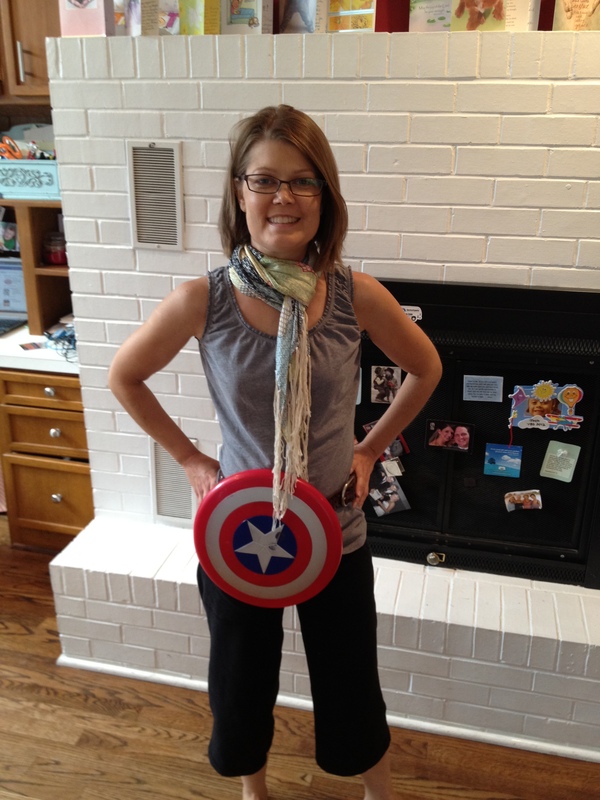 “I can wear his Captain America shield on my belt for protection.” Kimberly was thinking about how to protect her surgical site from our very active 5 year old. She decided that his frisbee like Captain America shield attached to her belt would do the trick. I reminded her that a Captain America shield to a little boy is a target not a protective pad. 7. “I was there for her tracheostomy in 2010.” Dr. Buyten, Kimberly’s ENT acquired special privileges to perform her tracheostomy on the morning of the transplant at Integris Baptist Medical Center. As the Anesthesiologist was preparing to talk to Kimberly about the plan for sedation during surgery, we overheard him talking to Dr. Buyten just outside our room. It was so reassuring to us that Dr. Buyten (who really understands Kimberly’s throat) was able to secure her airway and answer relevant questions concerning her anesthesia. 6. “Grandma is still here.” One of the first things I told Kimberly in post-op was that her nearly 100 year old Grandmother was still in the waiting room. She had been there all day. Hulda Atwater is one of the most amazing women we know. It was a joy to be with her in the waiting room all day. 5. “Dad, are you missing me on my trip?” I called to talk to Josh who was staying at my sisters house in Arkansas. He said exactly one sentence to me . . . he wanted to know if I was missing him. He did not even wait for an answer to his question . . . he ran off to play more with his cousins. I was not offended . . . I was so happy he was having a good time. Thanks Joe, Debbie, Jenna, and Emma! 4. “I named him Obi Wan Kenobi Dog Robinson.” My sister’s family totally wined and dined Josh all week. They even took him to Build a Bear Workshop where he built a dog dressed like the famous Star Wars Jedi master. He was all too proud to tell me his name. 3. “You guys have gone viral on Facebook.” We were totally blown away by the number of people who followed our saga on Facebook, Twitter, and this blog in the past two weeks. On the morning of surgery a friend mentioned to me that many were talking, following, and praying. Thank you! 2. “Your creatinine is .8” At Kimberly’s 10 day follow-up appointment today, her new kidney seemed to be working perfectly. One of the key toxins they look for in your blood that determine if your kidneys are working correctly is your level of creatinine. Today, Kimberly’s creatinine was .8, well within normal levels. In fact two physician friends today told me that Kimberly’s creatinine is lower than theirs. Amazing! 1. “Cookie Cake?” Before the transplant, Angie spent a few days with us while they were doing pre-op meetings. One night, Kimberly, Angie, and myself were sitting around talking. I said, “How do you thank someone for giving you their kidney?” We all three sat there pondering this question for a few moments. 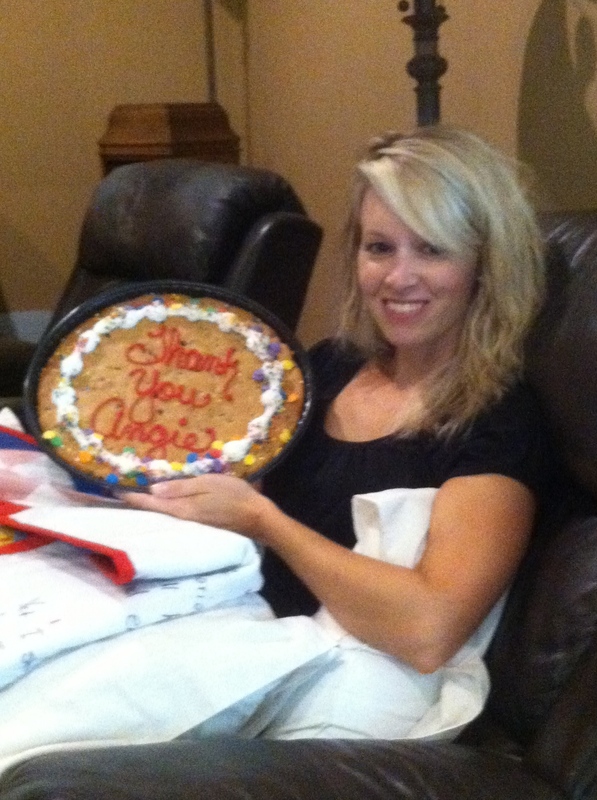 Kimberly broke the silence by declaring “With a cookie cake.” We all got a good laugh at that. Incidentally, we sent Angie a cookie cake yesterday afternoon. There you go! A Top 10 List. Though things are looking very good with Kimberly’s transplant, she still has tenderness at the surgical site. This most likely is due to the added complications that Kimberly had with the internal bleeding following transplant. They plan to do a CT scan on Tuesday of next week to see how things look. Pray that they will find nothing wrong, and Kimberly will heal quickly! Also pray that we will have wisdom to understand if her recovery process is normal, or if we need to alert the doctors that something is wrong. In light of this, also pray that we will have peace during this healing process. Continue to pray that Kimberly will not have any complications with the trach. She has had some air that has been trapped under her skin near the trach site. This is not a major issue, but is a bit uncomfortable. Pray it does not continue and clears up naturally and quickly. Pray that Kimberly does not catch any illness. She is on heavy immuno-suppression medications, and is always at risk of catching something. Pray that the surgical transplant team will be able to understand quickly if further surgery is necessary. If they can determine that soon, we will be able to remove the trach. Continue to pray for Angie’s kids and Joshua as they deal with mom’s who are healing. Pray that Angie’s follow-up appointment goes great next Tuesday. Kimberly is a superstar and looks so great! Thanks for posting the pictures! Thanks for posting the top 10. I will admit my favorite is the picture of Kimberly with the Captain America belt because she’s looking so good – reassuring to see the picture. I think Kimberly could give Captain America a run for his money! She looks like a superwoman in this pic! So much strength in one little body. All of you have been such a blessing throughout these medical issues…. The photo of Berly with the frisbee shield is priceless. I love this blog. I’m praying for you all, and am so blessed to be your friend. I love the Captain America belt and Jedi master Josh. Praise the Lord!! Loved the top 10 events! Thank you for all the updates! Will continue to pray for quick & perfect healing!! !